I intend to keep providing quality teaching in a stimulating, relaxed and friendly environment. Much of my pleasure in teaching is in seeing groups of students create work better than they can buy in souvenir shops. Our mutual reward comes when they walk out clutching their carvings with huge smiles on their faces. This shows me that I have achieved my aims as a teacher. 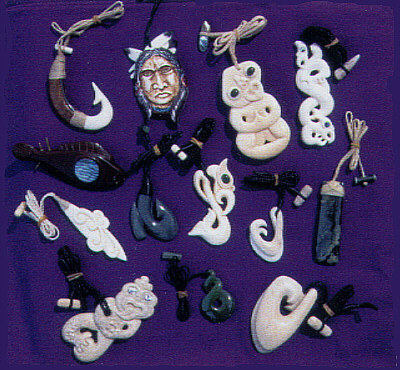 When I know they have absorbed the atmosphere of the studio with its carvings, artefacts, chunks of whalebone and other materials and local history displays, I am sure they are leaving with a deep experience of what carving is all about -- and a real treasure around their neck that will always remind them of Whitianga and New Zealand. 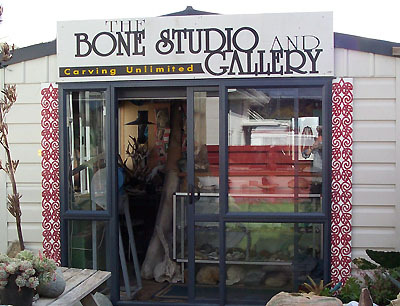 In the Gallery, I display "Carving Unlimited" and show the full range of styles, materials, quality and creativity of New Zealand carvers. Then, whenever someone views what is available, they have a full range of choices to make and if what they want is not in stock, they can order a piece made specifically for them by the artist of their choice and in their chosen material. As a craftsperson myself, I also understand the difficulties of making a living out of a creative art so I have the respect and required attitude to deal with carvers in a way that is positive and supportive and enables them to reach for their financial and creative potential. My pleasure here is achieved by linking artists and collectors in a win-win relationship.